The 2018 Keiko Fukuda Joshi Camp will be held from July 20 – 22 in Charleston, South Carolina. We would like to invite you to join us. Our special guest this year is Sensei Megumi Tachimoto from Japan. Sensei Tachimoto is the 2015 World Championship Silver Medalist, and 4 times World Champion, Bronze Medalist. On Saturday, July 21, the Camp is open to males/females/and children. Also, we will conduct Kodokan Kata Class. Ju No Kata / Nage No Kata. This Fukuda Joshi Camp is for Shiai and Kata Judokas. There will be a kata clinic with Sensei Eiko Shepherd on June 2nd and 3rd at Soko Joshi in San Francisco. The seminar will be all day both Saturday and Sunday and will cover Goshin-Jitsu and Kime-No-Kata. Sensei Shepherd is an eighth-degree black belt (hachidan) and an expert in kata. Click here to read more about Sensei Shepherd in this 2012 article from USA Judo (PDF). There will be a USJF Coach Certification Clinic in Santa Clara on Saturday, April 7, 2018 hosted by Santa Clara PAL. This is a good opportunity to get or renew your Coach Certification through USJF. They have cut down the requirements from a 2-day clinic previously to a one day clinic. Also, USJF certification is now recognized at USA Judo National events. Details and entry form attached. This looks like an amazing camp!!! Let’s all go!!! 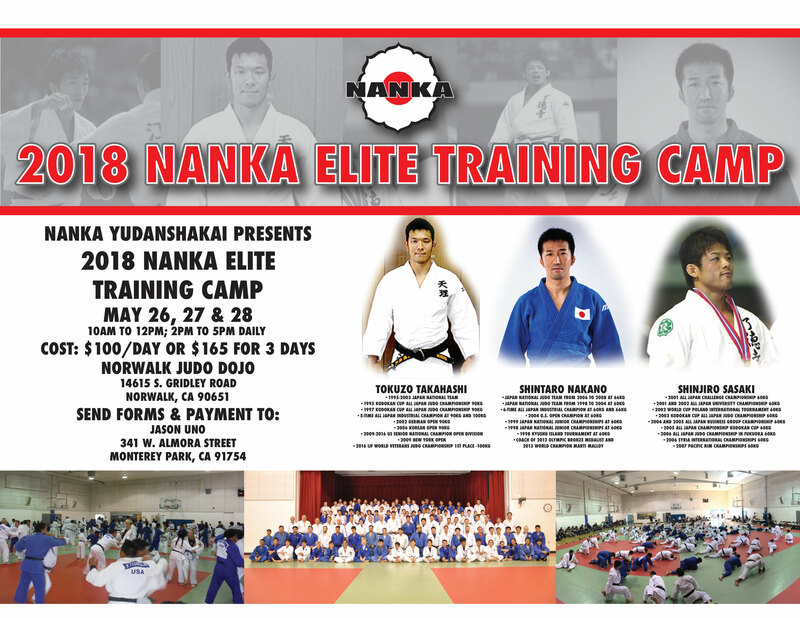 Nanka would like to invite you all to our 2018 Nanka Elite Training Camp during the Memorial Day long weekend. Please read the application and RSVP your spots as soon as possible. Look forward to seeing you all at the camp. The 29th Fukuda International Kata Championship will be held on Saturday, October 21, 2017. Registration form and information available at www.sokojoshijudo.com/kata. The USJF National Kata Conference will be held from July 24-28, 2017. Note that mail in registration ended on June 30, but walk in registration is still available. Click here for details, including registration form. Finally, the documentary Mrs. Judo is now available on Amazon for purchase or rent. Also available on iTunes. Please help us spread the word about the July Kata Conference, October Kata Tournament, and Mrs. Judo!! !